Home / GOVERNMENT/POLITICS / Opinion/Editorial / Is Buhari Winning the Fight Against Boko Haram? The emergence of the Chief of Army Staff, General Tukur Buratai and other service chiefs has dealt a huge blow to the menace of Boko Haram insurgency in Nigeria. The aerial, land attacks by the Nigerian military as well as the routing of their hide-outs in Sambisa forest coupled with the regional cooperation with neighbouring countries have helped to ease the excruciating pains caused by the 6-year existence of the blood-thirsty sect. The days of Boko Haram attacking Nigerian soldiers with their full army like it’s a conventional war seems to be over due to the military tactics used to counter their operations e.g. the Bama attack claiming over 2000 lives according to CNN, the raid of over 200 school girls from Chibok, what about the deadliest attack on Kano in January, 2012 that claimed over 100 lives and many more? It’s safe to say Boko Haram has only stuck to suicide bombings to remain relevant and create fear of their existence. The days of Boko Haram writing letters to villages to give them prior notice of their imminent attacks to ensure their vacation as we experienced in Borno may seem to have come to an end. But again, as a public affairs analyst and a Political Scientist who did a concrete research work on terrorism in Africa as a postgraduate student, my wish doesn't stop at Boko Haram being reduced to the bearest minimum but being totally eradicated so that families will stop losing their loved ones, able bodied people that could contribute to the development of this country will stop being maimed with their dreams hampered till the next life, so that the Internally Displaced Persons, IDPs can leave the camp to have a life, so that their kids can go to school and not end up forming another Boko Haram group in the future. I hope for a day where people can gather in public places at special days to celebrate without any fear of bomb blasts. As a journalist, I personally feel the news media is being saturated with what I refer to as 'tales by moonlight' by the Defence Headquarters for the purpose of pacifying and giving empty hopes to the Nigerian populace. 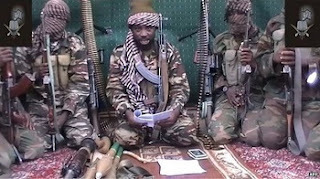 The Nigerian soldiers sing a victory song while they are being heavily backed by the infamous leader of the Boko Haram sect, Abubakar Shekau giving the song an 'ad lib' with the spoils from his recent attacks on the civilians and Nigerian troops. As the Nigerian troops are releasing photos of captured Boko Haram members, the sect is also releasing disturbing videos of the beheading of Nigerian soldiers. It is shocking to believe that the sect has killed more than 1,320 people in Nigeria alone since Muhammadu Buhari became president on May 29 according to an AFP report. I have edited several articles of Boko Haram financiers, impersonators, informants, crude oil suppliers, domestic merchants, wives, soldiers and other key figures being nabbed by the Nigerian troops. They come with picture evidences and the major part that has always caught my fantasy is where the military claims the culprits are currently being grilled for useful information which has been very positive. I believe every arrest of any key Boko Haram official should give a lead to their roots. By roots I am talking about their financiers. They are not invincible. I don't want to believe they are that perfect in covering their tracks. A part of the Boko Haram sect could have pledged allegiance to the rampaging terrorist group named the Islamic State in Syria, ISIS, suspected to be funding the sect as well as provision of arms and ammunition, the sect survived on the wealth of some prominent 'faceless' Nigerians who seem too powerful to be mentioned. The way Boko Haram soldiers are killed in large numbers daily without a reasonable decline in the size of their fighters prompt me to believe they have the power of resurrection which is a fallacy. There is this popular unfounded belief among Nigerians that the immediate past President, Goodluck Ebele Jonathan knew the financiers of the sect but was afraid to prosecute them due to the weight they pull. As a fan of the blockbuster movie 24hrs which details terrorism in across the world with planned attacks on the United States of America, every terrorist group's top official mentions a 'big name' that paves way for leads of breakthrough, but the otherwise is the case in Nigeria. President Muhammadu Buhari has assured Nigerians that Boko Haram will be history at the end of the year 2015 which many believe is a mere political talk. The Defence Headquarters had successfully made us believe Boko Haram was seeing its last days until the twin bomb blast of the Nyanya and Kuje areas in Abuja on the 2nd of October untimely laying several promising lives to rest and maiming several others. For the record, Abuja is the capital of Nigeria. An attack on the heart of the country of over 170 million people was more than a bloody attack but a confrontational statement. Boko Haram actually sent a message to Nigerians of the weight they could pull at will despite the success stories of the Nigerian troops flooding the social media. One may be forced to conclude that the Nigerian Army may only be winning the war on paper which amounts to a massive deceit of the Nigerian people. We all await the resultant effects of Buhari's incessant trips to the United States, France, United Kingdom, Niger Republic, Cameroon, Chad and others in request for military support and intelligence against the Boko Haram sect. The video of Boko Haram members and families celebrating Sallah openly in Sambisa forest, Borno state is a national insult which played out well. This is the same forest that is being frequently combed by the Nigerian troops through aerial and land attacks. Here is my question, who is lying? Where is the deceit coming from? Boko Haram or Federal Government? I wish to end this article with a reference to the plight of one Kwara state-born young man based in Abuja named Samuel Abolarin, 27 who lost his wife of just a year in the Kuje bomb blast in Abuja of the 2nd of October, 2015 as well as his mother-in-law,brother-in-law and his sister-in-law who is lying in the intensive care unit of the Trauma Centre of the National Hospital in Abuja without the knowledge of the hopeless fate of her loved ones. Samuel Abolarin is left with his baby who is barely a year old. For the rest of his life, he will live with the painful memories of the loss. This shall be passed from one generation to the other thereby leading to a historical hatred for the Northerners who dominate the Boko Haram sect. This is just one of thousands of pathetic stories of Nigerians after bomb attacks. How long can we take a 'paper victory' from the Nigerian Army? How long can we take diplomatic speeches on the Boko Haram terrorist group from the presidency? These are rhetorical questions I am leaving for my readers to ponder on.